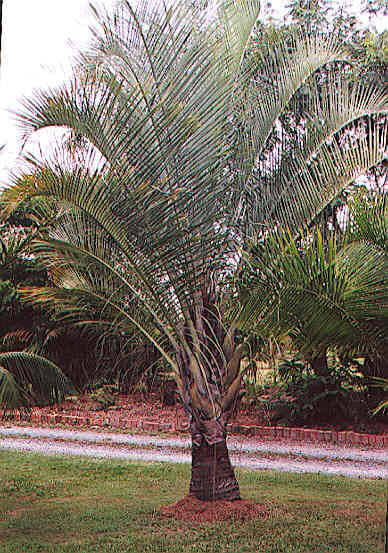 This is a very striking palm, with the leaves arising from three distinct points around the trunk, hence the name triangle palm. It can get to about 15 metres but in cultivation is usually only around 5m. The silver grey-green leaves, about 2.5 metres long, point almost upright from the trunk, but then arch gracefully about 1 metre from the tip. It prefers full sun, and regular watering, however, it can stand drought and part shade. Does not tolerate frost. Mulch well (but keep mulch away from the trunk to prevent collar rot). Fertilise in spring/summer with an organic fertiliser such as manure and/or fertiliser specific to palms (3:1:3 or 3:1:2 N:P:K). A very fast grower once established. It is also a very good container plant for a patio or large courtyard.